Rubin “Hurricane” Carter giving an impassioned speech at Concordia University. 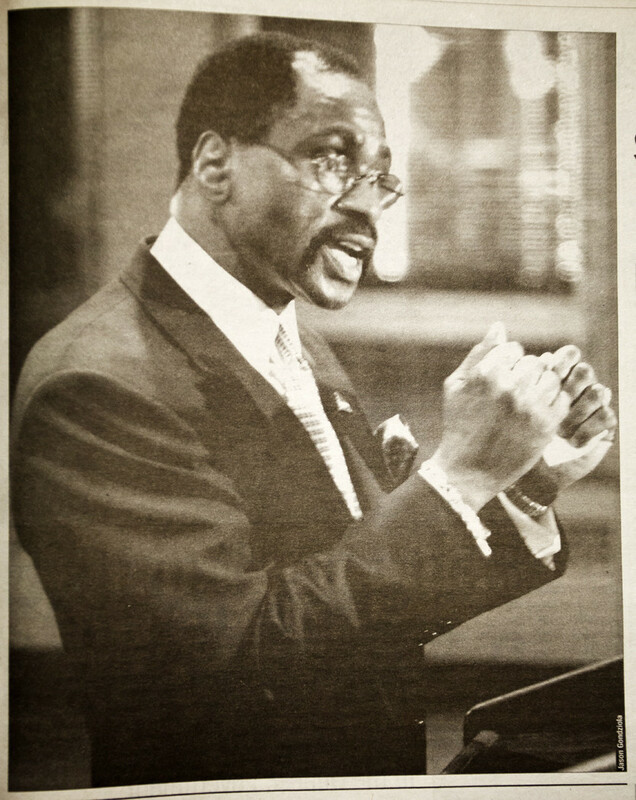 In the Feb. 10 2004 issue of The Link, our team covered the visit of Rubin “Hurricane” Carter to Concordia—a former boxing champion wrongly convicted of a crime he spent 19 years behind bars for. Bob Dylan famously wrote a song about his story. After Carter’s release, he continued to fight—this time for U.S. prisoners on death row. A biopic starring Denzel Washington made him a household name again to a younger generation. By Patrick Lavery. Photo Jason Gondziola. At the age of 67, Rubin “Hurricane” Carter is still fighting. These days, his fights take place in a different venue. Gone are the flash bulbs that lit up the boxing ring when he was a middleweight fighter. He’s traded in the gloves and trunks for a briefcase and a three-piece suit. The executive director of the Association in Defence of the Wrongfully Convicted, Carter now spends his days fighting for the release of others. He began his address to the crowd gathered in H-110 with a call to help Kevin Cooper, a California death row prisoner, who was to be executed last night. After giving the assembly the facts of the case, he urged the crowd to phone and fax Governor Arnold Schwarzenegger. With that, Carter launched into an hour-long positive message to Concordia students. “After spending twenty years for crimes I not only did not commit but would not and could not have committed, and narrowly escaping the electric chair… when you really think about that, ladies and gentlemen, it’s a pleasure for me to be anywhere,” he said. Carter kept his speech light and quick-moving, going from the problems he sees in the U.S. criminal justice system., to having Denzel Washington portray him in the 1999 movie The Hurricane, to the facts surrounding his release. Carter was critical of the American justice system and the way that different people are treated by it. Carter slowed down, though, to drive home certain facts. “I have become, in the eyes of some people, a symbol of a criminal justice system that is undeniably infected with racism,” he said. The speech took a darker turn when he spoke about his time in prison, and his absolute refusal to submit to the rules of the prison he was sent to. He told the crowd about the time he spent in solitary confinement. “It’s all in my attitude, everything is in attitude,” he said. Carter spent, off and on, almost 10 of his 19 years in solitary confinement, locked in a subterranean windowless cell. “It was at that moment, that I began to actively understand that if I was going to survive this prison, I was going to have to change,” he said. What he found was love. “Hate put me in prison. Love busted me out,” Carter told the crowd. Carter went on to explain his theories on racism. At a press conference after his speech, Carter condemned Canada’s anti-terrorism laws, saying that it leaves citizens with less privacy and allows them to be hassled crossing the border. One reporter asked about his response to those who claim he is guilty and should be in prison. Carter responded that some people believe in the system to the point where they can’t accept it was wrong. He took the opportunity to speak for Kevin Cooper again, and criticized the U.S. use of the death penalty.